LSA Technology and Performing Arts College is a learning community for students aged 11-18 and has a long and proud history of excellence since opening in 1955 as Ansdell County Secondary School. As one of the largest schools in Lancashire, we can offer a wide range of curricular & extra-curricular activities, along with Technology and Performing Arts College status. 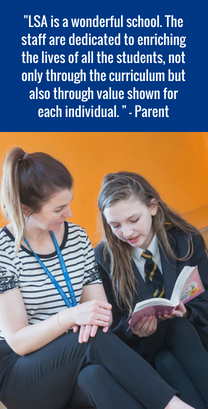 This is a comprehensive school which values all students equally, whatever their background or ability. We are committed to offering an excellent education, opportunities and high standards of learning and pastoral care for every one of our 1400+ students. I hope our website gives you a flavour of our wonderful, vibrant school and particularly a sense of the work and achievements of our students. They make the school an exciting and stimulating place to learn and to work. If you would like to know more about Lytham St Annes Technology and Performing Arts College, please do not hesitate to contact us by telephone, email or arrange a visit. The school’s vision: ‘A Learning Community In Pursuit Of Excellence’. This sums up our ethos and values. If you would like to request paper copies of anything you see on our website please contact us.